Even if you knew nothing of the life of the playwright Manfred Karge, you would probably still see something powerfully Brechtian in this uncompromising eighty-minute play of his, set in the turbulent darkness of mid-twentieth century Germany. When you learn that he was once a member of the Berliner Ensemble and a close associate of Brecht’s widow Helene Weigel, the influence becomes almost inevitable. Here is an embattled Berlin woman, indestructible as Mother Courage, whose struggles to survive degradation and worse are at once a specific commentary on a particularly nasty dictatorship and a transcendent study in human purpose and identity. This latter pursuit is at the heart of the matter because the woman, Ella, is doing her best to abandon her gender and shift into the persona of her late crane-driver husband Max. She has seen him heroically dragging his cancer-doomed body to work day after day, until there were no days left to him. If she leaves enough time, and alters her appearance sufficiently, then surely she can pass herself off as him in his old workplace, draw his pay, lead his life; from her own past observations of him, everyone there is too busy grafting all the hours for a pittance to have any interest in or knowledge of their workmates’ lives. Hence the title; with a little help from his widow, dead Max has turned into not-dead Max. In the process this hybrid thing that both he and she have become lives through the direst times of their nation; the rage and catastrophe still present from defeat in the war whose hundredth anniversary we – the British, that is, now celebrate; the economic pain flowing from the Versailles settlement; the hyperinflation of Weimar, the murderous rivalry between the Socialists and the Nazis; the emergence of the first concentration camps for such misfits as Communists, Jews and homosexuals. Transgenderists? Don’t even ask. In its own way, the play’s device sets up as bold a proposition about private lives and public earthquakes as that of Wolfgang Becker’s 2003 tragi-comic film Goodbye Lenin, in which an invalid mother in East Berlin is kept under the illusion, well after reunification, that the wall hasn’t fallen, nor capitalism arrived in the former GDR. Denial, dangerous though it is, has a place in the business of surviving. 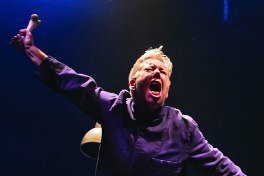 In the play’s single role – which helped to make Tilda Swinton’s name in 1987 in a production at Edinburgh’s Traverse Theatre directed by Stephen Unwin – Trisha Kelly blokes up a treat; hair part-cropped and part-floppy, torso big with modestly hidden pecs, mouth necking beer and belching, crotch bulging. What if the soldiers sense something and demand an inspection? After a chance encounter with Karge himself by director Tilly Branson during a research trip to Berlin, the author agreed to write a new scene which updates the play to take in the fall of the wall and the reunification of the country. This makes for a highly apt climax to what is essentially a drama about the cohabitation of opposites. With the stakes so high and the action so totally reliant on its sole exponent, nothing less than a storming performance from that person will do. It is positively begging for brilliance, and here, with Kelly, we get just that. For much of the time she is so thoroughly androgynous that it is easy to forget who, or rather what, she is. Which is surely one of Karge’s intentions in a dramatic scheme that sends a divided self through the wounds of a riven nation. In Kelly’s portrayal, the ironies of the heroine’s situation rouse a grim sort of belly-laughter. She is widowed, but by herself. Or should that be “himself”? She eats, breathes and sleeps with the person, indeed within the person, who bereaved her. She is divided, certainly, but does this condition not bring about a personal reunification – the falling of an inner wall? Without wishing to give too much away, take a look at the footwear of the creature at the end of the evening; worker’s boot on one foot, crimson stiletto job on the other. Got a problem with that? her stance asks defiantly; because she certainly hasn’t. Left, right, east, west, what else do you want to throw at me? On the evidence of the previous hour and a bit, a pile of applause. What lengths would you go to put the next meal on the table? As the Nazis come to power in Germany, a young widow discovers that her only means of survival is to take on her dead husband’s job and with it his identity. Her struggle to maintain this extraordinary deception for over forty years forms the focus of this hauntingly poetic and utterly gripping one-woman tour-de-force. Following a sell-out run at the Mercury Theatre, Colchester, Danielle Tarento presents a rare British production of this enthralling play that premiered at the Traverse in 1987, catapulting Tilda Swinton to fame. Join esteemed director Stephen Unwin, who directed Tilda Swinton in the original production, as he hosts an exclusive post-show Q&A with Man to Man playwright Manfred Karge who will be flying in from Berlin especially for the event. He will be joined by the show’s director Tilly Branson and critically acclaimed star of the show Tricia Kelly as they talk about the processes behind bringing Man To Man to the stage. This Q&A is not to be missed! This talk is free to ticket holders of Man To Man for the performance on the 26th November 2014 and will take place in the auditorium following the performance.